Delville Wood is a small forest next to to the village of Longueval which was the scene of an intense battle between British Empire and German forces during the 1916 Battle of the Somme. 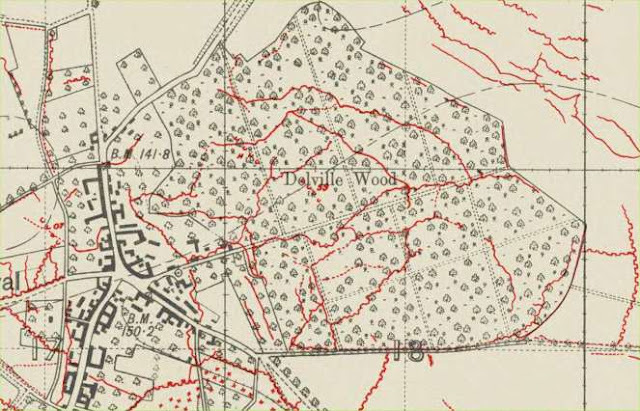 The South African Brigade had fought steadfastly under such appalling and prolonged circumstances that in the grim litany of the Somme's savagery of sustained attack and counter-attack, Delville Wood stands unenviably pre-eminent. The museum shortly after it had been inaugurated and today. The two horsemen are supposed to be Castor and Pollux, representing the brotherhood of English and Afrikaans. There is a replica outside the Government buildings in Pretoria. 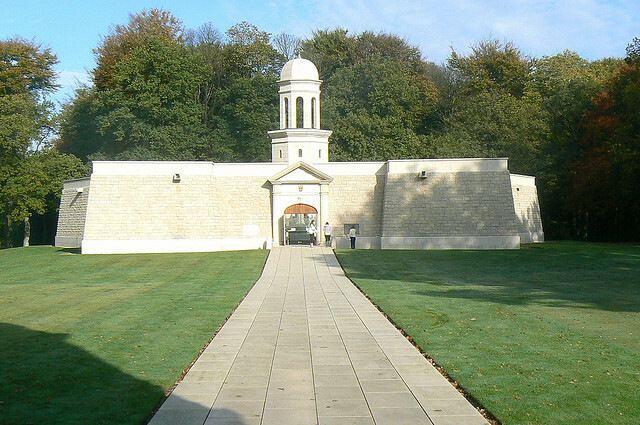 Further inside is the Delville Wood South African National Memorial. Unlike the other national memorials to the missing raised to commemorate the part played by Dominion forces on the Western Front in World War I, this memorial has no names inscribed on it. Instead, the names of the missing dead of South Africa were inscribed on the battlefield memorials to the missing, along with those of the dead of the United Kingdom. 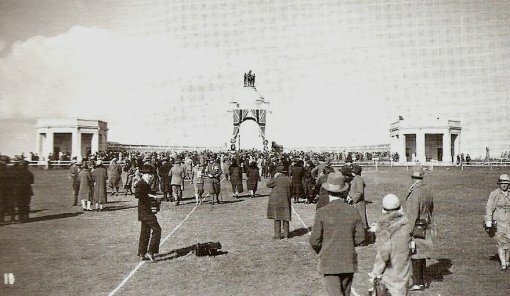 This memorial also serves as the national memorial to all those of the South African Overseas Expeditionary Force who died during World War I. A total of some 229,000 officers and men served in the forces of South Africa in the war. Of these, some 10,000 died in action or through injury and sickness, and their names are written in a memorial register that was kept at this memorial, and is now kept at the nearby museum. Opposite the Delville Wood South African Memorial, (which you can see here across the road) is Delville Wood cemetery located just off the D20 that runs between Longueval and Guillemont (11 km east of Albert), and contains 5,523 burials of which two-thirds are unknown. It is the third largest in the Somme battlefield area. Among the poignant inscriptions is this for 17 year old Pte Bernard Whittingham, killed July 23, 1916: "Mother's Baby Son Sorely Missed"
Another reads simply: "Here I wait"
The cemetery was constructed after the Armistice and mainly contains bodies recovered from the battlefields. 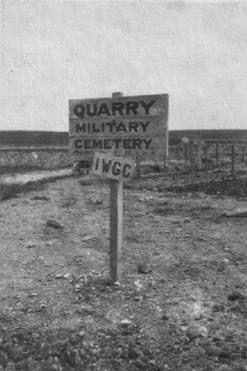 A smaller number of graves were moved in from nearby French and German cemeteries, making this the third largest British cemetery on the Somme. Almost all of the casualties date from July-September 1916 and are from the various Battles of Delville Wood. The high proportion of unknown graves probably reflects lengthy period which elapsed before many of the bodies were removed from the battlefield and buried. There are special memorials to the 27 casualties believed to be buried amongst the 3,593 unidentified burials. Three bodies found during the building of the Delville Wood South African Memorial opposite the cemetery were interred in it in 1984. 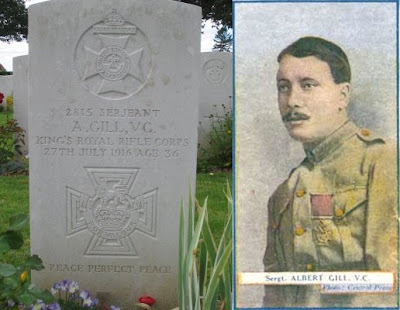 Sergeant Albert Gill, of the 1st Battalion King's Royal Rifle Corps, is buried in the cemetery. He was killed on 27 July 1916 during the fighting in Delville Wood whilst standing up under fire to direct his troops, an act for which he was awarded the Victoria Cross. For most conspicuous bravery. The enemy made a very strong counter-attack on the right flank of the battalion, and rushed the bombing post after killing all the company bombers. Serjeant Gill at once rallied the remnants of his platoon, none of whom were skilled bombers, and reorganised his defences, a most difficult and dangerous task, the trench being very shallow and much damaged. Soon afterwards the enemy nearly surrounded his men by creeping up through the thick undergrowth, and commenced sniping at about twenty yards' range. Although it was almost certain death, Sergeant Gill stood boldly up in order to direct the fire of his men. He was killed almost at once, but not before he had shown his men where the enemy were, and thus enabled them to hold up their advance. By his supreme devotion to duty and self-sacrifice he saved a very dangerous situation. This memorial to the bagpipers of all regiments of the Great War is located at Longueval as this was liberated by the 9th Scottish Division in July 1916 and hosted numerous pipers. It was officially unveiled on July 20, 2002 and on the wall you can see behind the statue are the cap badges of each regiment which had lost a piper during the war, carved by the CWGC. The entrance to the third largest of the Somme battlefield cemeteries, containing 3,872 First World War burials. It's directly across from High Wood fierce fighting took place in 1916. The first buried were 47 soldiers of the 47th (London) Division killed in the Battle of Flers-Courcelette on the September 15. They had been buried in a large shell hole in the days following the battle. By the time of the Armistice, further burials had taken place, bringing the number of graves to 101. 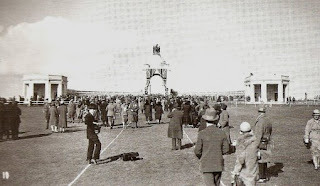 The extension followed in the years following the First World War when graves from the surrounding battlefields were transferred around the area. Although the cemetery primarily contains World War 1 graves, 165 soldiers were reburied there after World War II. These graves are together in one section at the far end of the cemetery.
" Tom, I always promised there would never be another, there never was, now we will soon be together again". The son of the leader of the Labour Party, Arthur Henderson, shares a plot here. David Henderson was a Captain in the Middlesex Regiment and killed at High Wood on September 15, 1916 aged 27. Nestled on the edge of High Wood alongside the road is this memorial to the men of the 1/9 Highland Light Infantry (Glasgow Highlanders). It was erected in 1972 as a cairn made up of 192 stones taken from High Wood near Culloden, commemorating the 192 soldiers of the Glasgow Highlanders who were killed here. At five feet seven inches, it represents the minimum height accepted for recruits into the battalion. This monument from the 1990s replaces the wooden cross erected on September 13, 1923 that served to commemorate the 47th Division's actions on September 15, 1916 as they finally captured High Wood itself. You can see two posts in the foreground- the one on the left is dated 1993 and the one my bike is resting on is from 1996- from the City of London. 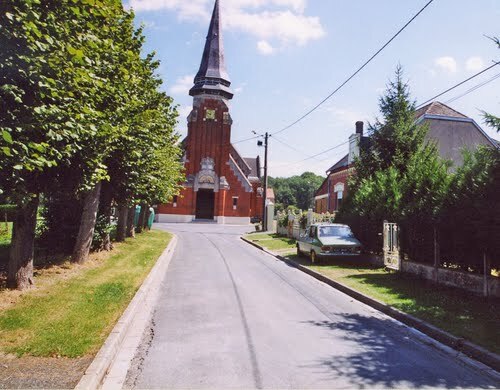 Martinpuich is a village about six miles south-west of Bapaume off the D929. 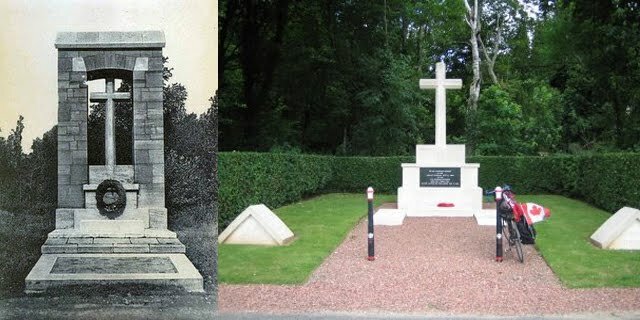 It had been captured by the 15th (Scottish) Division on 15 September 1916, lost in April 1918, and retaken in August 1918. There are 115 buried here- 80 British, 34 Australian and one Canadian. 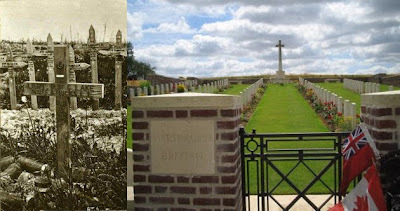 This cemetery is on the D197 south towards Maricourt and had been started in September 1915. 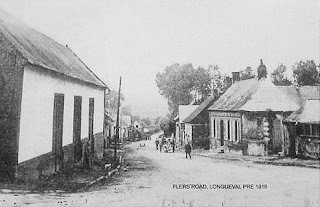 It was located near a dressing station which was known as 'Longueval Alley', or 'Longueval Water Point'. Either a trench, or even this very road, was known as Pall Mall in September 1916. Many of the graves are from October and November 1916. The graves are in regular rows, although within rows the spacing between graves is quite varied. The Cross of Sacrifice is at the triangular apex of the cemetery, and there are special memorials to two men known and one believed to be buried here. 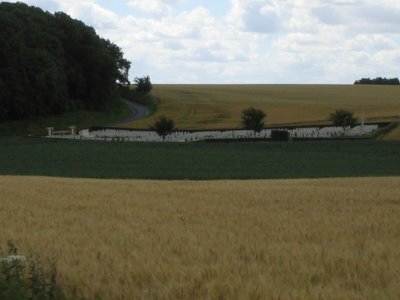 From the Cross of Sacrifice, one can look straight ahead over the cemetery to see Bernafay Wood ahead. Trones wood can be seen to the left, with Delville wood behind you. The road and track layout here is just the same today as it was during the Great War. One soldier here merits especial attention for me: Serjeant Walter Poulter of 'B' Battery, 190th Brigade Royal Field Artillery died September 26, 1916, aged 29. He had actually come from China (where he had been serving with the Maritime Customs) with the Shanghai Volunteer Contingent. By the end of that day, after an appalling loss of men, Montauban and Mametz were captured and the Fourth Army had advanced about one mile on a sector some 3.5 miles wide. 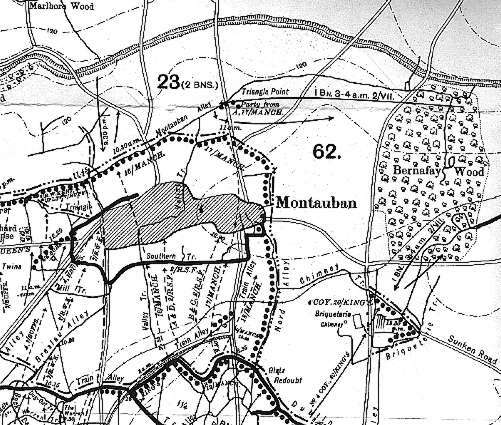 Montauban was to remain free until the end of March 1918, when it was retaken by the Germans in the “Spring Offensive”, to be liberated again in August 1918. 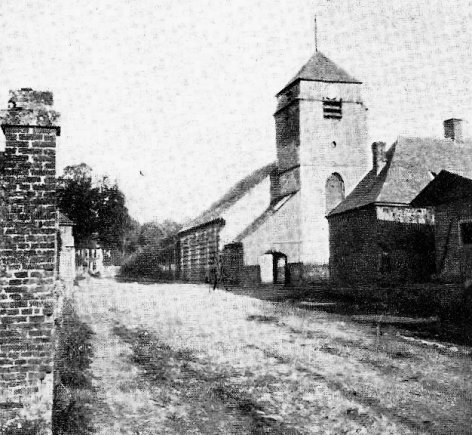 It was in the Montauban sector that Captain Nevill of the East Surrey Regiment brought a football for his men to dribble across No-Man’s Land. The dead of sixteen different nations lie here. 740 of the dead are from the Commonwealth, of whom 157 remain unidentified. Bernafay Wood British Cemetery just a mile south of Longueval on the D197; I took this photo after leaving Longueval Road CWGC. The village of Montauban was taken by the 30th and 18th Divisions on July 1 1916 and remained in British Imperial hands until the end of March 1918 before being retaken on August 25, 1918 by the 7th Buffs and the 11th Royal Fusiliers of the 18th Division. There are now 945 buried here with 417 unidentified as well as special memorials to 11 soldiers believed to be buried here. Other special memorials commemorate 12 soldiers buried in Bernafay Wood North Cemetery whose graves were destroyed by shell fire. Typically pristine Commonwealth war cemetery.